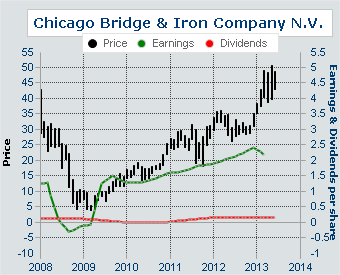 The GARP concept (growth-at-a-reasonable-price) has logical appeal. Find stocks where the cost of growth is lower than the cost of growth for the market overall, and preferably lower than some absolute level. The fact is that attractive GARP stocks are not always fast growing companies, just ones where what you have to pay for the growth you get is less than what you pay to own the growth level of the market. The PEG ratio is one helpful tool in that search. With slower growing GARP stocks, of course, it is important to distinguish between those that are slower growers that have the potential to continue at that level or surprise on the upside, versus others that may be slowing and likely to slow further, in which case they are not appealing. 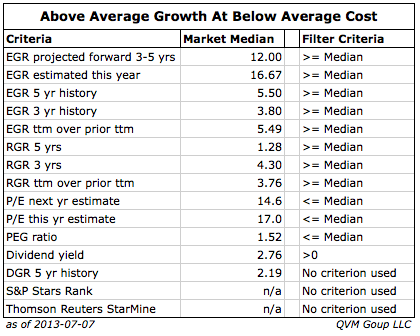 The best situation would be above market growth levels and below market valuation multiples. That is probably a typically small group of companies and one that need careful discrimination also. The higher growth may be transitory. The lower multiple may be the market correctly signaling lower growth ahead. Today, we did a filter to identify that second group of stocks with faster than market growth and lower than market valuation multiples. 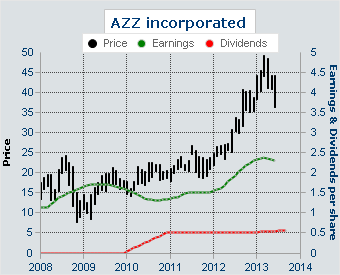 Instead of just looking at earnings growth, we looked at revenue growth, and required some level of dividend greater than zero. The dividend requirement was not to seek income, but simply as one indicator of management faith in the strength of the company — an imperfect indicator for that purposed, but one that we think helps a bit. In other articles, we will focus on slower growing GARP stocks and on low PEG stocks that may or may not have a lower P/E than the market. We required the earnings growth rates (“EGR”) and the revenue growth rate (“RGR”) to be greater than the median level of the stock market. For the yield, we required anything greater than zero. 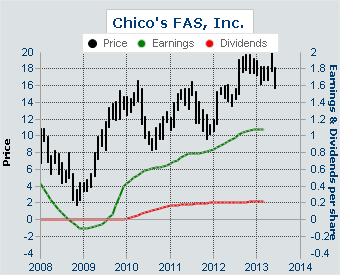 For the dividend growth rate (“DGR”) we had no requirement (means the stock may only have just recently begun paying dividends, or might have had an irregular payment history), but we did want a window on that attribute. We required the estimated P/E ratios and the PEG ratio to be below the market median. We had no requirement for the S&P Stars or Thomson Reuters StarMine year ahead ratings, nor for the Wright Investor’s Service quality ratings, but wanted a window on those too (see our blog for explanation of those rating scales). These are the names and symbols for those 12 with links to the latest Yahoo key financial data page for each stock. 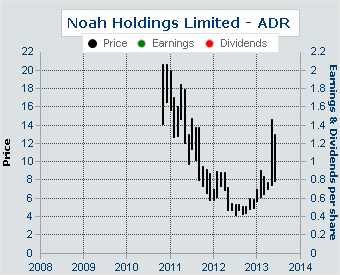 Noah Holdings Limited, through its subsidiaries is a service provider focusing on distributing wealth management products to the high net worth population in the People’s Republic of China (PRC). The Company provides direct access to China’s high net worth population. Noah Holdings Limited is a holding company and it operates its business through its PRC subsidiary, Shanghai Noah Rongyao Investment Consulting Co., Ltd (Noah Rongyao), its variable interest entity, Shanghai Noah Investment Management Co., Ltd (Noah Investment), and their respective subsidiaries in China. While Noah Rongyao conducts most of the Company’s businesses, it conducts its insurance brokerage business through Noah Investment and its subsidiaries. 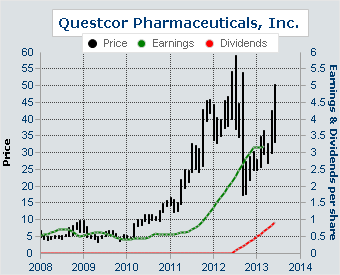 Its products choices consist of over-the-counter (OTC) products originated in China and designed to cater to the needs of high net worth population. Its registered clients were 12,353 as of June 30, 2010. 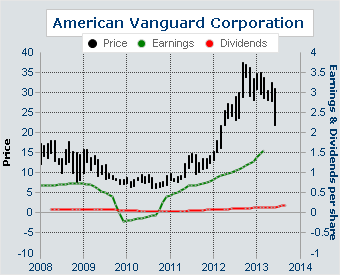 American Vanguard Corporation operates as a holding company. It is primarily a chemical manufacturer that develops and markets products for agricultural and commercial uses. The Company manufactures and formulates chemicals for crops, human and animal protection. It conducts its business through its subsidiaries, AMVAC Chemical Corporation (AMVAC), GemChem, Inc. (GemChem), 2110 Davie Corporation (DAVIE), Quimica Amvac de Mexico S.A. de C.V. (AMVAC M), AMVAC de Costa Rica Sociedad Anonima (AMVAC CR), AMVAC Switzerland GmbH (AMVAC S), AMVAC do Brasil Representacoes Ltda (AMVAC B), AMVAC Chemical UK Ltd. (AMVAC UK), AMVAC CV (AMVAC CV), AMVAC Netherlands BV (AMVAC BV), and Envance Technologies, LLC (Envance). In July 2012, it completed the restructuring of the International Sales & Marketing function of its principal operating subsidiary, AMVAC Chemical Corporation. On November 30, 2012, AMVAC and TyraTech, Inc. formed Envance Technologies, LLC, in which the Company owns 60% interest. AZZ incorporated (AZZ) is an electrical equipment and components manufacturer, serving the worldwide markets of power generation, transmission and distribution, and the general industrial markets, and a provider of hot dip galvanizing services to the steel fabrication market nationwide and in Canada. The Company operates in two segments: the Electrical and Industrial Products Segment, and the Galvanizing Services Segment. The Company operates primarily in the United States of America and Canada. Effective February 1, 2012, AZZ Blenkhorn & Sawle Limited (B&S), an indirect wholly owned subsidiary of AZZ, acquired substantially all of the assets of Galvan Metal, Inc. In April 2013, it completed the acquisition of Aquilex Specialty Repair and Overhaul LLC (Aquilex SRO). 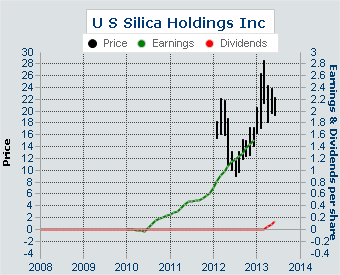 US Silica Holdings, Inc. is a silica sand supplier company. The Company is a producer of industrial minerals, including sand proppants, whole grain silica, ground silica, fine ground silica, calcined kaolin clay and aplite clay. The Company operates in two segments: oil and gas, and industrial and specialty products. The Company’s shipping capabilities include five of the class-one railroads, barge, full truckload, partial truckload and intermodal. The Company’s products include proppants, whole grain silica, ground silica, fine ground silica, testing silica, recreational silica, aplite, kaolin, hydrous kaolin and FLORISIL. It also operates as a research and development specialist for customized products and solutions. The Company serves a range of industries and applications, which includes oil and gas, glass, chemicals, foundry, building products, fillers and extenders, recreation, industrial filtration and treatment, and testing and analysis. 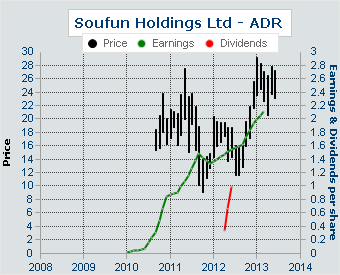 SouFun Holdings Limited (SouFun) operates as a real estate Internet portal in China. The Company has real estate-related content, search services, marketing and listing coverage of over 300 cities across the People’s Republic of China. The Company also operates the home furnishing and improvement Website. Through its Websites, it provides marketing, listing, e-commerce and other value-added services and products for the People’s Republic of China’s real estate and home furnishing and improvement sectors. Its Websites support active online communities and networks of users seeking information on, and other value-added services and products for, the real estate and home furnishing and improvement sectors in the People’s Republic of China. The Company provides marketing services, listing services, other value-added services and products, and e-commerce services. On February 8, 2012, the Company disposed its 90% interest in Beijing SouFun Information Consultancy Co., Ltd.
Chico’s FAS, Inc. is a specialty retailer of private branded, casual-to-dressy clothing, intimates, complementary accessories, and other non-clothing gift items under the Chico’s, White House / Black Market (WH/BM) and Soma Intimates (Soma) brand names. The Chico’s brand primarily sells designed, private branded clothing focusing on women 30 and over. The WHBM brand offers feminine and alternative to designer fashion selling fashionable and clothing and accessory items, primarily in black and white and related shades with seasonal color splashes. The Soma brand sells designed private branded lingerie, loungewear and beauty products women who are 35 years old and over. It also produces catalogs and operates e-commerce Websites and a call center that sell its merchandise nationally and internationally. The Boston Proper brand s an online and catalog based retailer of women’s high end apparel and accessories. On September 19, 2011, it acquired Boston Proper, Inc. (Boston Proper). 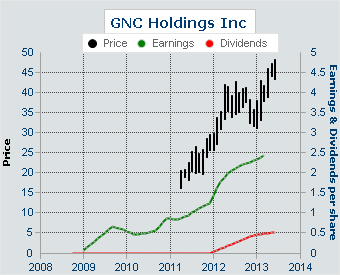 GNC Holdings, Inc. (GNC) is a holding company. The Company is a global specialty retailer of health and wellness products. The Company has three segments: Retail, Franchise and Manufacturing/Wholesale. Corporate retail store operations are located in the United States, Canada, and Puerto Rico, and in addition the Company offers products domestically through GNC.com, LuckyVitamin.com and www.drugstore.com. Franchise stores are located in the United States and 54 international countries, including distribution centers where retail sales are made. The Company operates its primary manufacturing facilities in South Carolina and distribution centers in Arizona, Pennsylvania and South Carolina. The Company manufactures the majority of its branded products, but also merchandises various third-party products. It sells products through a worldwide network of more than 8,100 locations operating under the GNC brand name. Chicago Bridge & Iron Company N.V. (CB&I) is one of the integrated engineering, procurement and construction (EPC) services providers and process technology licensors, delivering solutions to customers primarily in the energy, petrochemical and natural resource industries. CB&I consist of three business sectors: Steel Plate Structures, Project Engineering and Construction, and Lummus Technology. Through these business sectors, the Company offers services both independently and on an integrated basis. As of December 31, 2012, the Company had more than 900 projects in process in more than 70 countries. On February 13, 2013, it acquired The Shaw Group Inc. (Shaw). 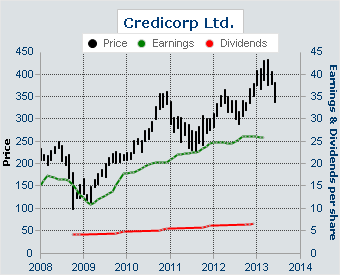 Credicorp Ltd is a Peru-based company engaged in the financial sector. The Company’s main activities include the provision of commercial and investment banking services and securities brokerage. The Company is also active in the insurance sector, with the provision of a variety of insurance policies in the fields of the commercial property, automobile, life, health and underwriting. As of December 31, 2011, the Company owned nine subsidiaries Banco de Credito del Peru (BCP), Atlantic Security Holding Corporation, El Pacifico Peruano – Suiza Compania de Seguros y Reaseguros, Prima AFP, Grupo Credito SA, CCR Inc, Credicorp Securities Inc, BCP Emisiones Latam 1 SA and Tarjeta Naranja Peru SAC. 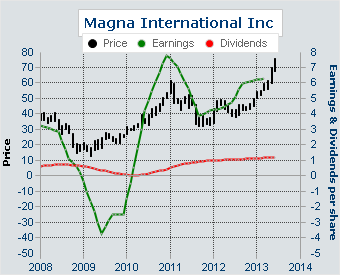 Magna International Inc. (Magna) is a diversified global automotive supplier. It designs, develops and manufactures automotive systems, assemblies, modules and components, and engineers and assembles complete vehicles, primarily for sale to original equipment manufacturers of cars and light trucks. Its capabilities include interior systems, exterior systems, seating systems, powertrain systems, closure systems, roof systems, body and chassis systems, vehicle engineering and contract assembly, vision systems and electric vehicles/systems, electronic systems, and through its Magna E-Car Systems partnership (E-Car Systems). Magna operates in three geographic reporting segments: North America, Europe and Rest of World. In August 2011, it acquired Grenville Castings Ltd. In November 2011, it acquired ThyssenKrupp Automotive Systems Industrial do Brasil Ltda. In November 2012, its Magna Powertrain operating unit had completed the transaction to acquire ixetic Verwaltungs GmbH (ixetic). National Oilwell Varco, Inc. is a provider of equipment and components used in oil and gas drilling and production operations, oilfield services, and supply chain integration services to the upstream oil and gas industry. The Company operates through three segments. Its Rig Technology segment designs, manufactures, sells and services complete systems for the drilling, completion, and servicing of oil and gas wells. Its Petroleum Services & Supplies segment provides a variety of consumable goods and services used to drill, complete, remediate and workover oil and gas wells and service drill pipe, tubing, casing, flowlines and other oilfield tubular goods. Its Distribution & Transmission segment provides maintenance, repair and operating supplies and spare parts to drill site and production locations worldwide. In July 2012, its subsidiary, NOV Distribution Services ULC, acquired CE Franklin Ltd. 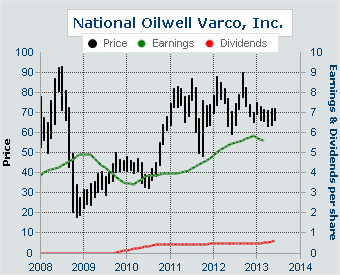 In February 2013, National Oilwell Varco Inc acquired Robbins & Myers Inc. This entry was posted on Sunday, July 7th, 2013 at 4:03 PM and is filed under Data. You can follow any responses to this entry through the RSS 2.0 feed. Both comments and pings are currently closed.